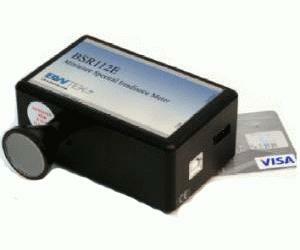 The BSR112 is a miniature Spectral Irradiance Meter designed for field, industrial, and lab applications. The BSR112 comes with a plug-and-play USB 2.0/1.1 interface thus makes it easy for use with a desktop or laptop computer. Optimized software is provided for characterization and measurement of many application lighting devices and systems. Standard software features include timeline recording, data smoothing, color measurement, chromaticity, color temperature, external triggered pulsed light capturing, and other data handling functions. The spectral irradiance meter is ideal for lamp and LED characterization and color analysis, solar studies (requires different input optic options), photostability testing, photobiology and photochemistry. A Software Developers Kit (SDK) is provided together with demo source.